LOS ANGELES—As we set off for our destination off the Southern California coast, Captain Rex Levi weaves Mr. Barker’s LegaSea, a 55-foot Chris Craft yacht, between the massive cargo ships plying Los Angeles Harbor. The dockworkers’ strike of the past winter is over but still reverberates at sea as the behemoths queue 35 deep, waiting their turn to offload cars, clothes, and other merchandise at the Port of Los Angeles. Mr. Barker’s LegaSea belongs to environmental group Ocean Defenders Alliance and is named for Bob Barker, the game-show host and animal rights activist who donated $150,000—the price was right—toward the boat’s purchase. As we set out on a one-hour cruise, two gray whales on our left are also navigating a path amid the 1,000-foot-long ships—an ever-present danger during the marine mammals’ annual migrations. “We brake for whales,” says ODA founder Kurt Lieber. A 50-foot-long boat called the African Queen, sunk in 90 feet of water, poses perhaps as great a threat to whales as to dolphins, seals, and sharks that can become entangled in derelict fishing gear snagged by the shipwreck. So on this spring day we’re on a mission to liberate them from these “ghost nets,” among the thousands around the world silently killing marine mammals and other ocean animals. Imagine there's a fence running through the wilderness and that each animal that passes by—deer, bear, bison—is in danger of getting its head stuck in the chain link and starving to death. That happens every day in the world’s oceans as lost, abandoned, and derelict fishing gear trap countless numbers of marine animals for years, decades, and perhaps even centuries. The African Queen happens to be a local ghost fishing hot spot. Its resting place is just outside the boundary of California’s ban on gill nets—huge vertical nets that hang in the water—within three nautical miles of the coast. Boats that deploy gill nets, which have been blamed for inadvertently catching dolphins, whales, and other marine mammals, often cross over the African Queen. The mission today: dive to the wreck, remove some of the nets, and free trapped animals. For Lieber, a Chicago native, these expeditions have become a life mission. Since 2002, he has embarked on more than 180 trips with his crew of volunteer divers and deckhands, recovering more than 32,000 pounds of fishing nets and 12,000 pounds of lobster and crab traps just along California’s coast. Over the years, he’s seen just about every kind of critter caught in ghost nets—sharks, sea lions, lobster, eels, sea turtles, and even whales. “I really didn’t expect this to become a long-term thing, but this fishing gear never stops, so we don’t stop,” Lieber says. On this day’s dive, the team gets a glimpse of a global catastrophe. “Just nets on top of nets down there,” Marti said in between the team’s first and second dive on the wreck. For Marti and the dive team, the African Queen is a familiar foe. Over the years they’ve rescued nurse sharks, wolf eels, and lobsters from its web of nets and also seen the remains of sea lions, fish, and other animals they weren’t able to save. Diver Kim Cardenas has been down to the site before. On this trip she sees just how much work is left. A frustrating endeavor, but not unique, says NOAA’s Parker. She has worked for the agency’s marine debris program for the past four years, researching derelict fishing gear hot spots and participating in marine debris cleanups along the United States’ East and West coasts, the Great Lakes, and the Northwestern Hawaiian Islands. Just as ocean currents are pushing plastics to convergence zones, also called gyres, abandoned nets often end up funneled into the same spots. NOAA’s 244-foot research vessel, The Sette, last year recovered 57 tons of fishing nets and plastic garbage in the Northwestern Hawaiian Islands. The archipelago is home to the critically endangered Hawaiian monk seal, which has been found to be highly susceptible to entanglements with ghost gear. Like a fine-tooth comb, the reefs along the 1,200-mile chain of atolls sift and snag drifting gill nets, trawl nets, longline fishing gear, and other ghost gear. An estimated 57 tons of derelict nets end up in the 139,000-square-mile Northwestern Hawaiian Islands region every year. The global reach of ghost nets remains mostly unknown as few studies have looked at the worldwide consequences of abandoned fishing nets. But World Animal Protection, a Europe-based conservation group, estimates as much as 640,000 tons of fishing gear is lost or abandoned every year. In the U.S., NOAA researchers recently looked at seven fisheries and found that derelict fishing gear affected all of them. They discovered that 85,000 abandoned lobster and crab traps are ghost fishing in the Florida Keys National Marine Sanctuary, while in the Chesapeake Bay, more than 913,000 crabs are caught by derelict traps each year. And more than 1,500 marine animals—including seals, sea lions, dolphins, sharks, 22 species of fish, and 15 species of birds—were found dead among 870 derelict nets discovered in the Puget Sound over the course of one year. But help is on the way. ODA is just one of several volunteer teams that have joined a global nonprofit network called Ghost Fishing. Together, teams from Italy, Iceland, Australia, the U.S., and other countries have pulled up thousands of nets over the past decade, saving countless marine animals in the process. In Washington state, more than $7 million from federal wildlife agencies is paying for the removal of more than 4,000 nets and nearly 3,000 traps from waterways. That has saved more than 3.2 million animals from entanglement, according to the Northwest Straits Foundation. Still, the problem is ever growing. Before 1950, there were no reports of turtles stuck in marine fishing gear. 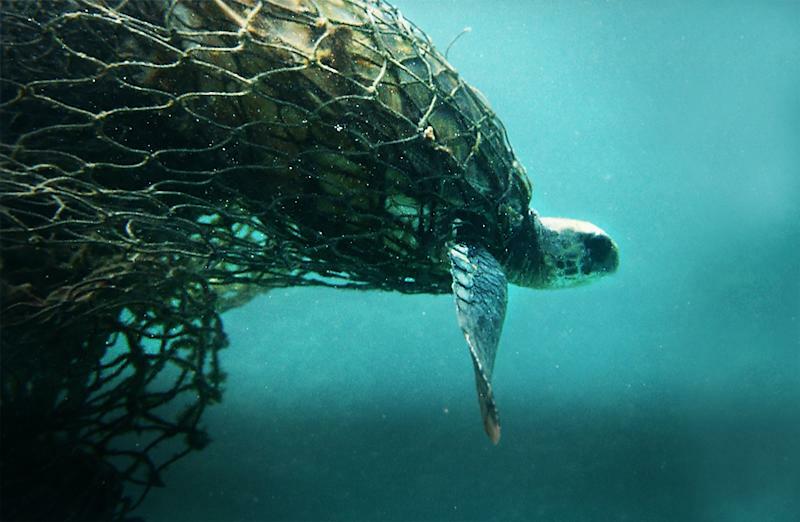 By 1970, all six species of sea turtles had been reported entangled in ghost gear. Today, more than 200 marine species worldwide are impacted by derelict fishing gear. First, technological advances have allowed much of the commercial fishing operations to move further into the open ocean, where retrieval of lost nets is rarely an option. But the biggest change has come in the materials used to make fishing gear. Long-lasting synthetics used in today’s nets keep derelict gear fishing for years, if not centuries. Parker also noted the lack of national, not to mention international, regulation of ghost fishing. “Each fishery is different, and the rules have to make sense to be put in place,” she says. One of the biggest challenges is getting both the conservationists and the commercial fishing operators to fully understand the issue. One fish caught by a ghost net is one less for a fisher to catch and sell. Zeke Grader, a 40-year industry veteran and executive director of the Pacific Coast Federation of Fishermen’s Associations, says the fishing industry has a stake in keeping vessels from losing their gear. By fishing only on weekdays, herring gillnet boats avoided entanglements with recreational sailboats over weekends and spent that time retrieving nets they had lost while fishing. “The most important aspect is figuring out how to minimize gear loss for whatever fishery you’re looking at, whether it’s gillnets, trawl, drift nets, or traps, and second, when gear is lost, you’ve got to ensure a way to recover it,” Grader says. For fishers, recovery of just one lost net can mean savings of thousands of dollars. “Any way we can give fishermen the opportunity to go back and retrieve their fishing gear is good regulation,” Grader notes. Worldwide, efforts are under way to prevent the loss of fishing gear. Better Nets, Fewer Ghost Nets: Improved fishing gear attachments and designs are limiting unwanted disconnects and snagging incidents. Zoning Laws: Keeping fishing nets out of areas where crab and lobster traps are in place can limit the number of conflicts and entanglements. Curfews on Catching: Restricting the time a net can “soak” or stay in the water without being attached to a boat can limit the chances of losing nets. Biodegradable Trapdoors: Using biodegradable materials in fishing gear can shorten the duration of ghost fishing. In Maine, all lobster traps are required to come equipped with a biodegradable hatch, so if the trap is lost, the hatch will disintegrate and animals won’t get stuck inside. Location, Location, Location: Placing GPS tags on individual nets, as many European fisheries do, is leading to much higher recovery rates of ghost gear. Recovery Compensation: It’s not just conservation; money can be a good incentive too. Fishing boats in Northern California’s Dungeness crab fishery are heading out in the off-season to retrieve the thousands of lost and abandoned traps. The program sponsored by the University of California, Davis, lets the boaters sell the traps back to their original owners—saving crab fishermen money, compensating other local fishermen, and saving marine life from being trapped in ghost gear. Recycling Program: Getting rid of old fishing gear can cost a pretty penny, and that price can deter fishers from properly disposing of nets. For over a decade, South Korea has offered a waste fishing gear buyback program, where fishers receive cash for every 100-liter bag of net they bring back. Parker believes the tide is changing on ghost fishing. Grader agrees, but cautions against painting the fishing industry as rapacious ravagers of the sea. Back aboard the LegaSea, Lieber is busy hauling in the nets surfaced by the dive team. He’s also musing on how much more good could be done if he could just get the local fishing fleet to have him on speed dial. The divers make their way back to the vessels’ swim step after cutting and successfully floating a few hundred yards of gill net and squid net wrapped around the African Queen. But instead of a deckhand, an unexpected guest greets the divers: A sea lion pup has hopped aboard for a quick rest. The pinniped looks young, confused, and scared—shivering and emaciated. A massive decline in Pacific sardines—one of the sea lion’s primary food sources—has created an epidemic of starving sea lions stranded on California’s shoreline. Just this year, more than 1,450 animals have been admitted to marine mammal rehabilitation centers up and down the coast. Lieber calls the local marine mammal center to get tips on what to do with the new crew member. “So don’t even let her warm up here? She’s shivering,” Lieber asks. But while he’s still on the phone, the pup rolls off the swim step, darting back into the water as the first diver climbs the ladder and onto the boat.